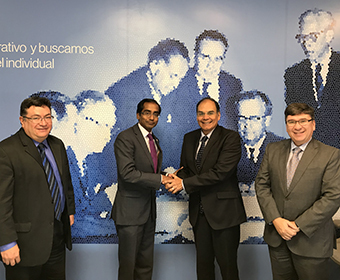 (Nov. 13, 2017) -- Bernard Arulanandam, interim vice president for research at The University of Texas at San Antonio (UTSA), and Arturo Molina, vice chancellor for research and tech transfer at the Instituto Tecnológico y de Estudios Superiores de Monterrey (ITESM)/Monterrey Institute of Technology and Higher Education, have signed a Memorandum of Understanding to establish collaboration activities and facilitate long-term academic and economic cooperation between both institutions. Monterrey Tec and UTSA will foster joint research and faculty exchanges in the areas of cybersecurity, big data analytics, cloud computing and nanotechnology, among others. In addition to signing the agreement, the UTSA delegation of Zenteno, Arulanandam and Jaclyn Shaw, UTSA director for research support, had the opportunity to present UTSA’s research plan to Monterrey Tec leadership and faculty. Monterrey Tec will leverage UTSA’s expertise in cybersecurity to further expand their research and education. The agreement will include organizing a one-day conference on the topic in Mexico City in spring of 2018. “Together, we can collaborate to address computational challenges, which are critical to the security of both countries. As the MOU evolves, there will be additional research areas for cross-collaboration,” added Arulanandam. UTSA has strong academic ties with Mexico. The university currently has 30 cooperation agreements with universities and organizations with our neighbor to the south. UTSA’s relationship with Mexico is part of its Latin America initiative, which aims to increase partnerships through research and exchange. Additionally, UTSA has had eight faculty-led study abroad programs in the first half of 2017 with 118 student participants. The UTSA Research Office has been hosting students from Monterrey Tec in a summer research internship program since 2014 and has hosted 27 students to date. UTSA houses ConTex, a UT System collaboration with Mexico’s National Council of Science and Technology (CONACYT). ConTex connects researchers across disciplines to develop mutually beneficial ideas and solutions for the U.S. and Mexico. Funding supports Mexican doctoral students at UT System institutions, with the goal to create a total cohort of 150 Ph.D. students over the next five years. In 2017, ConTex awarded funding for 25 doctoral fellowships and 10 postdoctoral fellowships. ConTex also funds collaborative research projects, to increase and enhance exchanges between faculty from UT System and Mexican universities, and serve as seed grants to pursue larger grants. In 2017, nine cross-border teams were awarded collaborative research grants across multiple disciplines. Explore international opportunities at UTSA.